Talent management software enables the control and management of various aspects of HR actions and helps maintain employees’ details from the date of joining to the date of retirement. Moreover, talent management software incorporates HR activities such as performance management, career pathing management, succession planning, compensation management, assessment and other core HRsolutions, for instance payroll management and leave management. Talent management software helps to develop the productivity of HR staff by providing self-service web interfaces. Talent management software allows businesses to manage and access their employee details effectually on a real time basis. Numerous software development providers and vendors are laying emphasis on enrichment of talent management software by integrating value added processing such as human resource compliance management tools, workforce analytics, and other features, for instance process design control. Moreover, increasing workforce globalization is projected to enhance the large scale implementation of talent management software by small and large enterprises. Rising demand for better architectures for talent and recruiting functions is vital to the growing functioning of talent management software models, for instance employee benefit administration, employee verification, and employment application processing. The talent management software market has been segmented in terms of deployment, enterprise, solution, end-use industry, and region. While considering deployment, the market has been segmented into cloud, and on-premise software. The global market by enterprise type comprises small & medium enterprises (SME’s) and large enterprises. The small and medium enterprise (SMEs) segment consists of the income generated from the sale of talent management software to enterprises/companies with strength of 1-500 employees. Large enterprise segment reflects the revenue generated from the sale of talent management software to enterprises/companies with a labor force of more than 500 employees. In large enterprises, adoption of talent management software is already high as it is a cost effective process, improves security measures, and assists in compliance management. The solution segment of the talent management software market has been divided into performance management analytics, career pathing management software, succession planning software, compensation management, and assessment software. In terms of end-user industry, the market has been bifurcated into BFSI, telecom and IT, government, healthcare, education, manufacturing, retail and others. Geographically, the market has been segmented into North America, Europe, Asia Pacific, Middle East &Africa, and South America. North America remained the dominant region in the talent management software market in 2017.The region accounted for almost one-third of the global market revenue share and is expected to continue its leading position throughout the forecast period. This is due to the fact that a large number of mid-sized and small enterprises are leaning toward talent management software. Europe captured the second largest market share in 2017. Asia Pacific, which showed the fastest growth in 2017, buoyed by rising adoption rate of digitalization in talent management over the years, is however seeing hurdles in the growth of the talent management software market. Factors such as different regulatory compliances and limited availability of efficient Internet connectivity infrastructure are seen as key reasons for the potential growth slag. This report on the global talent management software market provides market revenue share analysis of the various key participants. Some of the key players profiled in the talent management software market report include Cornerstone OnDemand, Inc., Halogen Software, Inc., HireIQ, IBM Corporation, SumTotal, Lumesse, Synergita, Oracle Corporation, PeopleFluent, Saba Software, Inc, SAP SE, Paylocity, Talentguard, and ELMO Cloud HR & Payroll. 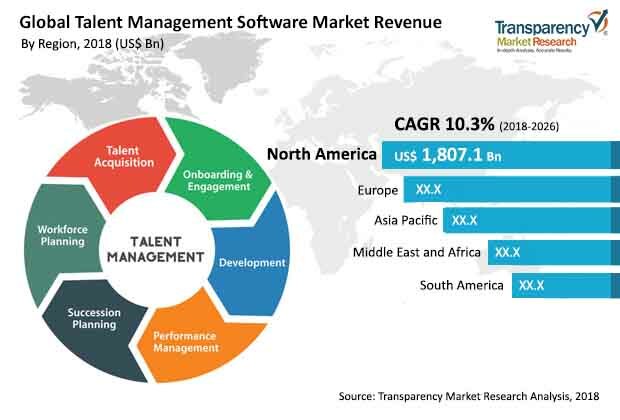 The talent management software market report provides analysis for the period 2016 – 2026, wherein the period from 2018 to 2026 is the forecast period and 2017 is the base year. The report covers all the major trends and technologies playing an influential role in the market’s growth over the forecast period. It also highlights the drivers, restraints, and opportunities for the analysis of market growth during the said period. The study provides a complete perspective on the evolution of the global talent management software market throughout the above mentioned forecast period in terms of revenue (US$ Mn). The market overview section of the report demonstrates market dynamics such as drivers, restraints, and opportunities that influence the current nature and future statusof this market, key market indicators, integration challenges, end-user adoption analysis, and key trendsof the market.Further, key market indicators included in the report provide the significant factors which are capable of changing the market scenario. These indicators are expected to define the market position during the forecast period and provide an overview about theglobal talent management software market. Amarket attractiveness analysis has also been provided for every segment in the report, in order to present a thorough understanding of the overall scenario in the talent management software market. The report alsooffersan overview of various strategies adopted by key players in the market. The talent management software markethas been segmented interms of deployment, enterprise size, solution, end-use industry, and region. In terms of deployment, the market has been segmented into cloud and on-premise deployment. The enterprise size segment includes small & medium enterprises (SME’s) and large enterprises. While considering the solution segment, the market has been divided into performance management analytics, career pathing management software, succession planning software, compensation management, and assessment software. In terms of end-user industry, the market has been segmented into retail, banking, financial services & insurance, telecom & IT, healthcare, transportation & logistics, energy and others. The report covers the analysis of these segments across North America, Europe, Asia Pacific, Middle East &Africa, and South America, along with the qualitative analysis for market estimates supplementing the growth of the talent management software marketduring the forecast period. The report also highlights the competitive landscape of the global talent management software market, positioning all the major players according to their presence in different regions of the world and recent key developments initiated by them in the industry. The comprehensive talent management software market estimates are the result of our in-depth secondary research, primary interviews, and in-house expert panel reviews. These market estimates have been analyzed by taking into account the impact of different political, social, economic, and technological factors along with the current market dynamics affecting the talent management software market growth. This report provides all the essential information required to understand the key developments in the talent management software market, growth trends of each segment and region. It also includesstrategies of companies, financial information, SWOT analysis, and developmentsunder the company profile section. Also, the report provides insights related to trends and their impact on the market. Furthermore, Porter’s Five Forces analysis explains the five forces namely buyers bargaining power, suppliers bargaining power, threat of new entrants, threat of substitutes, and degree of competition in the talent management software market.This report also provides a comprehensiveecosystem analysis for thetalent management software market. It explains the various participants including software & third-party vendors, system integrators,and distribution channelswithin the value chain operating in the market. Primary research involves telephonic interviews, e-mail interactions and face-to-face interviews for detailed and unbiased reviews on the talent management software market across geographies. Primary interviews are usually conducted on an ongoing basis with industry expertsand participants in order to get the latest market insights and validate the existing data and analysis. Primary interviews offer firsthand information on important factors such as market trends, market size, competitive landscape,growth trends, and outlook. These factors help to validate and strengthen secondary research findings and also help to develop the analysis team’s expertise and market understanding. Moreover, the data collected and analyzed from secondary and primary research is again discussed and examined by our expert panel. The global talent management software marketreport provides company market share analysis of the various key participants. Some of the key players profiled in the report include Cornerstone OnDemand, Inc., Halogen Software, Inc., HireIQ, IBM Corporation, SumTotal,Lumesse,Synergita, Oracle Corporation, PeopleFluent, Saba Software, Inc, SAP SE,Paylocity, Talentguard, and ELMO Cloud HR & Payroll.